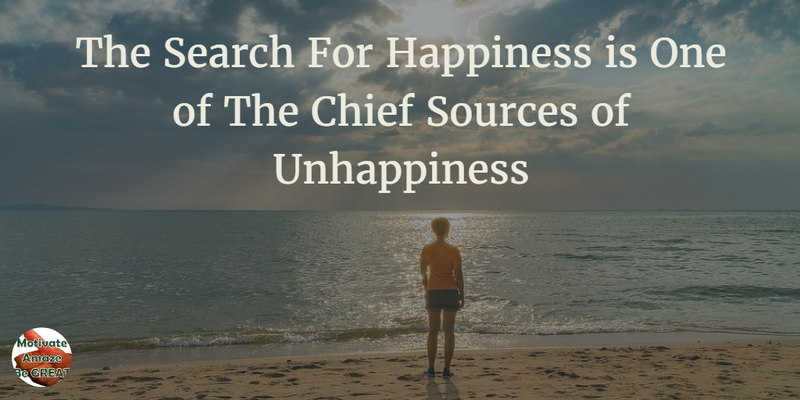 Why The Search For Happiness is One of The Chief Sources of Unhappiness - Motivate Amaze Be GREAT: The Motivation and Inspiration for Self-Improvement you need! People want to be happy, it's that simple. Why they want to be happy? They want to feel good and content with their lives. Simple stuff! Sometimes a friend is doing something that might not be the best for him, other friend warns me: "just let him do it, as long as he's happy no problem." A girl friend of mine, changed her whole life because of a guy. Went to another country, has a job just to pay bills, abandoned her professional career, I asked her why? "Because I want to be happy." Other girl friend is always feeling unhappy, so she desperately tries to find ways to spark some happiness in her life. With things like overeating, smoking, drinking, endless searches for the "right movie", the "right guy", the "right job". Some people that say they'll be happy when they have "that car", "that house", "that income" or win the lottery. Sometimes you'll be happy, sometimes you'll not. We need to accept it, because that's just how life works. It's impossible to always be happy with everything. Being unhappy with something makes you strive for better. The problem is most people see happiness as a feeling, not as a state of mind. The difference is that a feeling is on and off just like a light switch, a state of mind is your attitude towards something, the way you look at things. To be happy, you need to have a positive approach on life. Turning the switch on will not do it, because soon that switch of happiness will be turned off. Bad things will come and happen in your daily living, but if you have a positive attitude towards them you can turn a negative into a positive. To me, that's what happiness is all about. Sure you can google happiness, but you won't find it by constantly searching for it in real life. In fact, you don't need to do it. What you need is to have the right state of mind and happiness will be there already. Like they say, happiness is not a destination, it's a way of living. Again, you won't find it, you must apply the right attitude to everything you do. People that search for happiness are treating it like it's a feeling or an emotion. You can't search a feeling or emotion, those are things you do and put in motion. You might ask: "How can I do it? What do I need?" Most people look for happiness because they are unsatisfied, they think the cause of it it's their partner, their house, their car, their job, their boss or their luck. But in reality the source of unhappiness is themselves. Deep inside they know something is wrong in their lives, but it's easier to blame something or somebody for it. They can easily switch that something or somebody, for a new thing. They switch partner, switch house, switch car, switch jobs, switch country or whatever. Probably they'll have a few moments of satisfaction, but they are not addressing the real cause, soon they'll be back blaming something and being unhappy with what they have. That's why the search for happiness is one of the chief sources of happiness. By looking for happiness and not realizing that happiness is already there, you can only become more unhappy, because you'll never find the perfect situation, you're searching for the wrong thing. Be real honest with yourself, the true cause of unhappiness is within you. There are some things in your life you're not taking care of. Maybe it's your personality, maybe it's the way you look, maybe it's the way you think, only you can know. What you have to do is to analyze yourself, what can you improve to become a better version of you? Start with that! No excuses! Embrace personal development to the fullest with the right attitude. Be grateful for the things you already have, give them value, count your blessings. Happiness is the state of mind you need to adopt, they say the joy is in the journey not in the final destination. How right they are! Share this article with your family and friends, help them find the real meaning of happiness and stop searching for something they won't find.